It is the baby’s first Yule, and the last one in Salem for all of us. My daughter has taken a new job and will be moving on the 31st. So we are gathering for a week to plan, party, and pack. It has been a special time of ending one chapter of our lives and the beginning of another. My daughter and I have spent 3 days cooking and cleaning for today’s Brunch/Open House. My most important contribution has been babysitting, for my son-in-law drove to the new city to find a place for them to live. We were hoping that he and Great-Grammie would be back yesterday, but they did not arrive until today. Still, the party commenced. In the living room, the Yule tree is decorated with the unbreakable ornaments on the bottom. (Baby Dear loves to pick them off and bang them on the floor.) Bowls of almonds, dried cranberries (this is New England), and chocolate/raspberry treats are ready for the snacking fingers of the guests. The library is decorated also. A bowl of chocolate and peppermint kisses are ready for guests. Baby Dear’s toys are also in this room, for one of the guests is a 2-year-old who may enjoy playing with them, too. The buffet is set up in the kitchen. Eggs Benedict, a scramble of vegetables and kielbasa, and potato/corn chowder are the three main dishes for the Brunch. 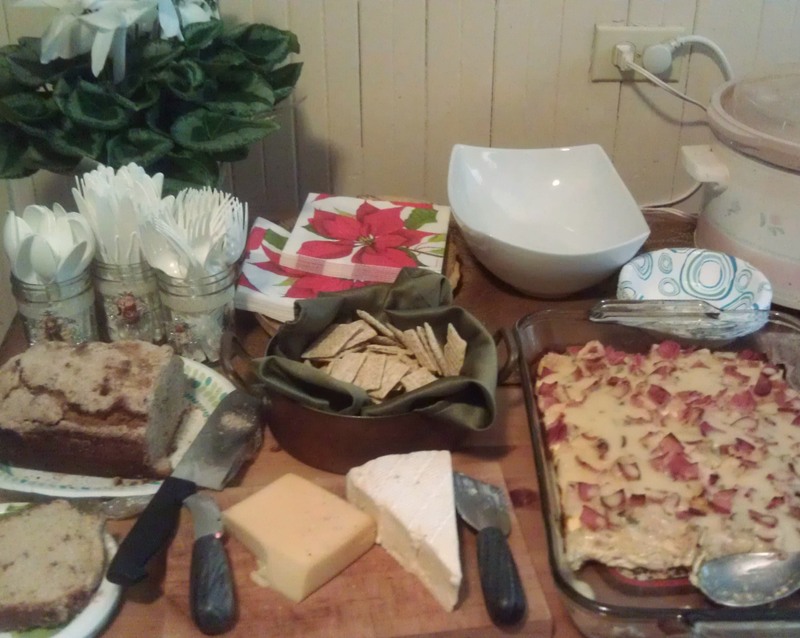 There is also a cheese platter, a cinnamon streusel bread (brought by one of the guests), a vegan friendly salad, and plates of cookies rounded out the feast. Drinks included hot cider, sparkling sparkling cider, coffee, and champagne with pomegranate juice. As happens with good friends, some folks arrived promptly at 11 am and willingly pitched in to help. Others arrived throughout the afternoon, with the final couple arriving around 5 pm. 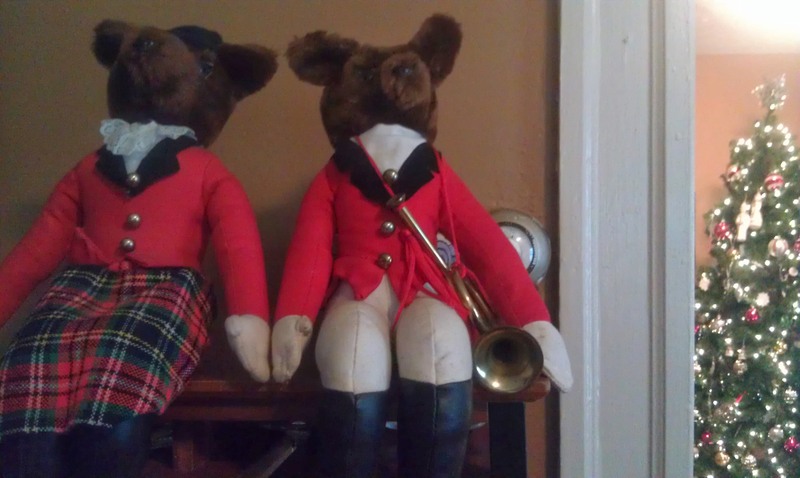 They were still here when Great-Grammie and my son-in-law finally arrived. There was much love in this home today. One of the guests asked me how I was celebrating Yule. I smiled and said, “I am doing this, and tonight I shall blog.” She was planning a more traditional ritual tonight, but I had done one this morning and so I am content. This is the Winter Solstice. It is the longest night of the year. The lights in the community around us are merry and bright. We gather together in groups to support and love each other at a time when we could have been filled with fear and despair. Astrologers from the most ancient times knew about this date, but the sun is not brighter to the naked eye for a few more days. It is the 25th that is celebrated as the birthday of ancient Gods, including Mithras and Dionysus. But to the ancient Norse, this is not a story of a birth. Instead, this is a story of resurrection. We celebrate this holiday with the giving of gifts, tucked prettily underneath a tree. The greatest gift of all, though, comes not in a package. Instead, it is the gift of hope, brought to us by a loving father who sacrifices his time and energy to whisper his words of comfort to a despairing humanity.